The Microban® Disinfectant Spray Plus treatment on water losses is recognized by major insurance companies! Destroys harmful microorganisms on contact! This high profile, EPA-registered anti-microbial kills just about everything in its path: allergy- and disease-causing germs bacteria, fungi, mold and mildew. Microban Disinfectant Spray is a true “professional strength” antimicrobial, nearly 10 times stronger than so-called “competitive” products, yet it is also a remarkably safe product. Its active ingredients are used pharmaceutically, medically and for the post-harvest treatment of fruits and vegetables to protect against microbial damage during storage and distribution. You’ll even find those same ingredients in common antibacterial wipes. Microban doesn’t require the use of gloves, a respirator or safety goggles for spraying applications. You don’t even have to wipe or rinse it off most surfaces. It can even be fogged into air ducts to help prevent the spread of airborne bacteria and odors (We recommend the fragrance-free formula for this application). Microban Disinfectant Spray truly is the best of both worlds – potent disinfecting properties with safe active ingredients. Microban is suitable for hospital and healthcare institutions animal care facilities and any other type of environment that requires absolute cleanliness. It’s an excellent choice when faced with jobs that include decontaminating textiles, mattresses, bedding and other cloth-related items. 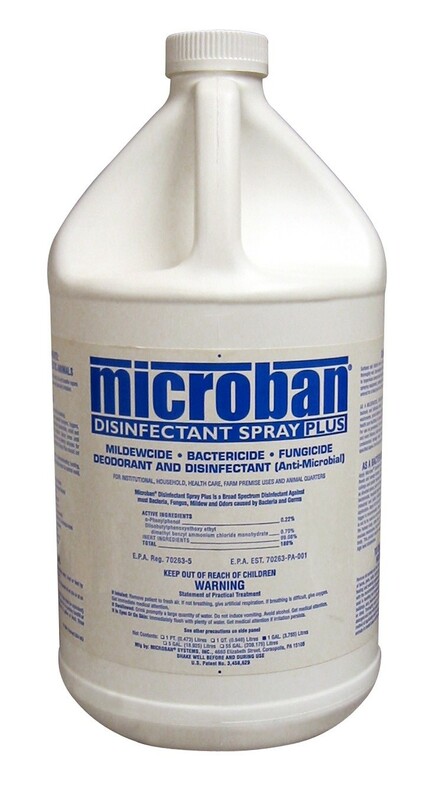 Microban Disinfectant Spray covers 1,500 square feet per gallon and works equally well on both hard and soft surfaces. Protects against germs and odor on virtually any surface. Antimicrobial action kills allergy and disease-causing germs, bacteria, fungi, mold, and mildew. Water-based, nonflammable bactericide, fungicide, deodorant, antimicrobial all in one unique formulation. One application kills mold, mildew, bacteria odors, and provides long-lasting residual protection. Microban® Disinfectant Spray Plus is E.P.A. approved for many decontamination applications including sewage backups, removal of carcasses, etc. Microban® Disinfectant Spray Plus kills gram negative bacteria, the bacteria encountered in sewage backups, and toilet overflow situations. Microban® Disinfectant Spray Plus is E.P.A. approved for both spray and fogging applications. Excellent for decontaminating textiles, mattresses, bedding, etc. Microban® Disinfectant Spray Plus has no insecticide capabilities. Apply via sprayer to porous surfaces at a rate of 1,500 square feet per gallon. Spray until moist, brush into carpeting, and allow 10-20 minutes for drying. Not available in California. Please specify if ordering from Canada.